This example shows how a sales executive can quickly assess performance at all levels within the organization. 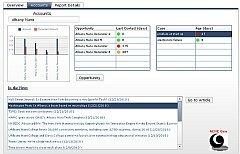 An initial summary view provides a visual alert of under-performing regions and allows the executive to drill down to regional performance. Sales data is further broken down to look at metrics for sales teams as well as individual representatives allowing managers to spot and address potential issues. The demo is a mashup of marketing campaign data with Google maps using Centigon Solutions GMaps Plugin. 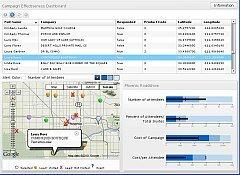 Marketing users can analyze summary measures about each road show within the campaign such as their budgeted and actual cost, and the percentage of invited leads that attended the event. The next level of analysis allows users to drill into each road show location and see which leads attended the event and the product interests for each event attendee. 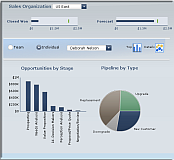 A sample dashboard for a sales representative allowing her to get an at-a-glance overview of her sales numbers in relation to her quota. The dashboard is actionable and allows the rep to perform some what-if-analysis to devise a strategy to most effectively contact her customers. The sales rep can see the status of open opportunities and open cases per account as well as up-to-the-minute RSS company news feeds before calling the customer.